Believe it or not, I do have an affinity for more mundane cars too – not just performance cars. For instance, I actually do like the Toyota Prius, I’m partial to the Volkswagen Golf, and the Subaru Legacy hits a soft spot for me. The Honda Accord might as well be added to the list too. I have experienced different generations of Accord dating back to when I was a kid. That was the first time I was taken for a drive with my cousin in his (admittedly souped up) ’92 Accord coupe. I loved it. When he eventually upgraded to a ’96 Accord sedan, I loved it even more. In fact, I remember telling him that I wanted it for my first car and called dibbs for when the time came for him to get a new car. In the end, my first car ended up being a ’97 Acura CL with a manual transmission. It was pretty nice for a first car. It was loaded to the nines (which isn’t much by today’s standards), though the kilometers were high. The Acura CL was essentially a Honda Accord underneath the skin with a fancier design and features. So in a way, my first car ended up being a Honda Accord after all. Today, the Accord coupe is no longer offered. That could be because large coupes are about as in demand as a Jersey Shore reunion. But I also wonder if the coupe was axed because of the new styling of the sedan. 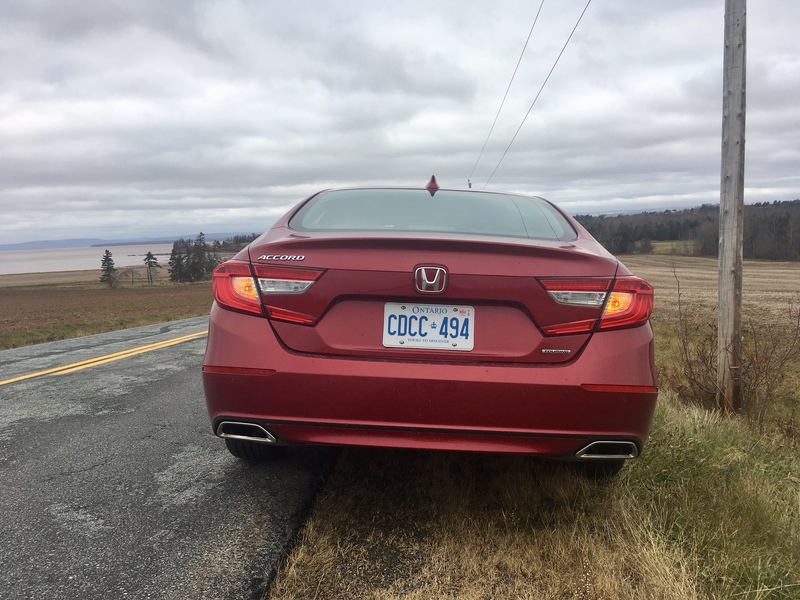 Taking a decidedly ‘four-door coupe’ approach, with swooping lines in the rear, Honda probably figured they could hold on to the loyal Accord coupe buyers out there with the new design all while efficiently eliminating a body-style. For me, the styling is actually a bit hit or miss. 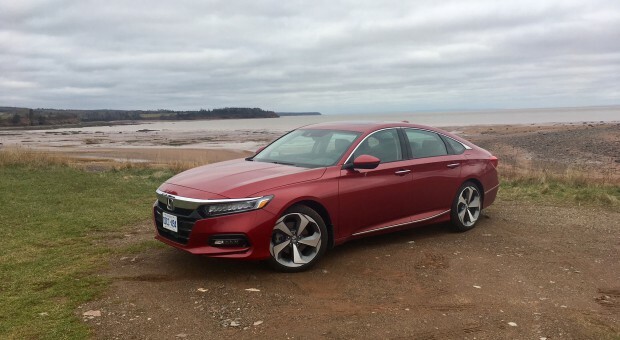 This could be because I prefer the more conservative and classy design of the generation before it, but also because the Accord has a few awkward angles. The bulbous front hood being one, the awkward asymmetrical tail lights being another, along with a chrome bar spanning the width of the front end bordering a little too much on being gaudy. 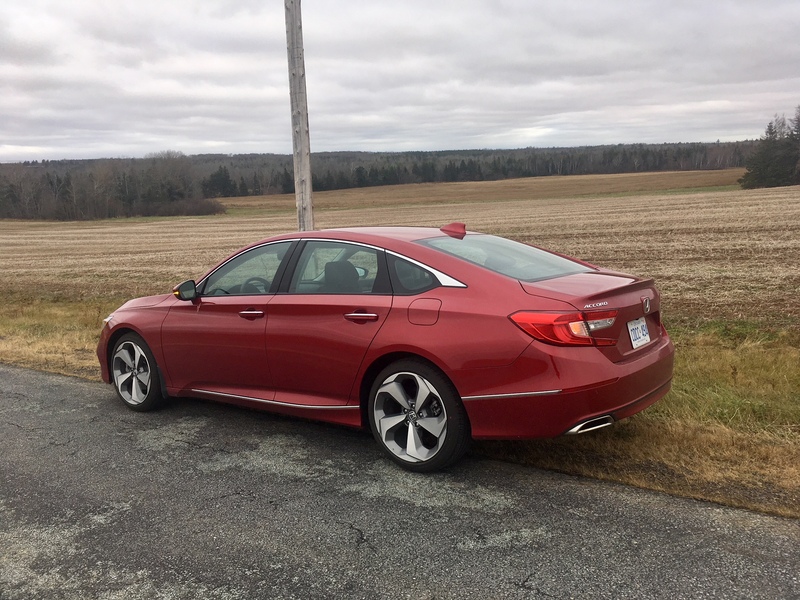 Still, the Accord likely fulfills its mission of standing out because a lot of people took time to examine it closer while it was parked. One guy next to me at a red light in a Dodge Grand Caravan seemed to be in a trance by my tester’s 19-inch wheels. He only snapped out of it once the lights turned green. Happily, the interior is a lot less polarizing. In fact, it likely has the best interior in the segment, though I have no doubt the folks at Toyota would strongly object thanks to the new interior design of the Camry. 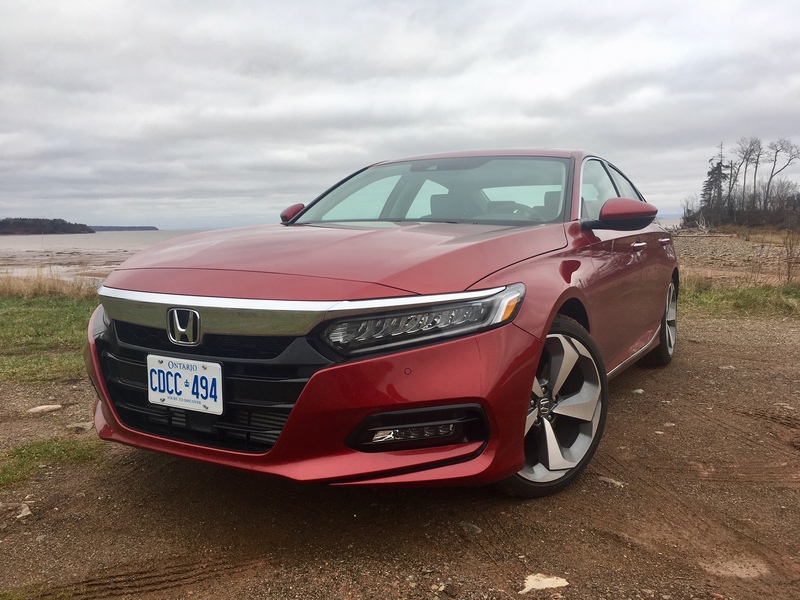 The Accord’s approach is more conventional than the Camry’s with a simplistic centre stack that features a large infotainment screen. And, better late than never, the infotainment system itself has finally been upgraded from the rather unintuitive system of years past. It also features Apple CarPlay and Android Auto. The icons are much clearer, more logically laid out and easier to access. Also, the rumours are true: Honda has re-added the much beloved volume knob. There is also a tuning knob for symmetry, but my only complaint with that is that it’s placed too far out of the driver’s reach. Otherwise, all buttons are easy to access and have a premium feel. 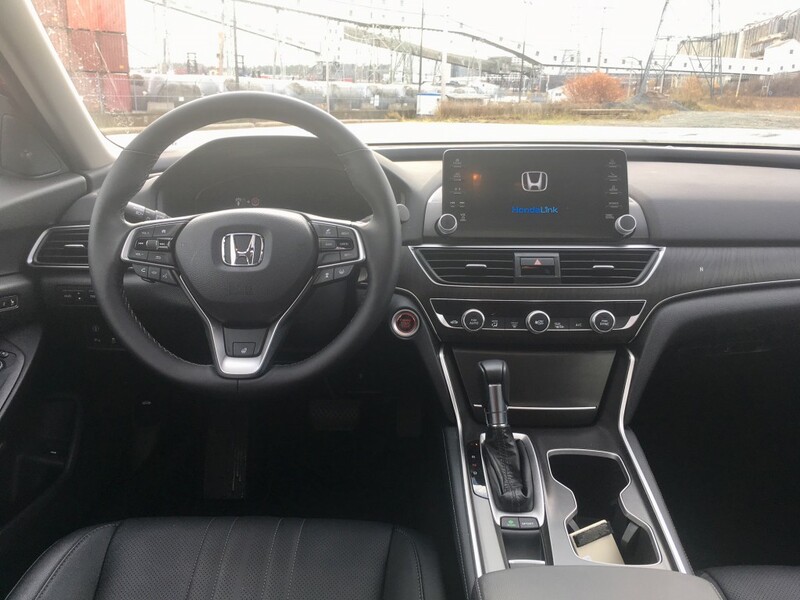 In fact, the entire cabin has a decidedly premium feel – one that contends with Honda’s own dedicated premium brand, Acura. That means there are plenty of goodies such as heated and cooled seats, dual-zone climate control, automatic high beams, a head up display and a heated steering wheel to name a few. Regarding the latter, it was much welcomed during its two-week stay with me, but it heated up to luke-warm at most. That’s better than nothing, but I don’t know why the heated steering wheel is seemingly so weak. Interior passenger room is noticeably increased. 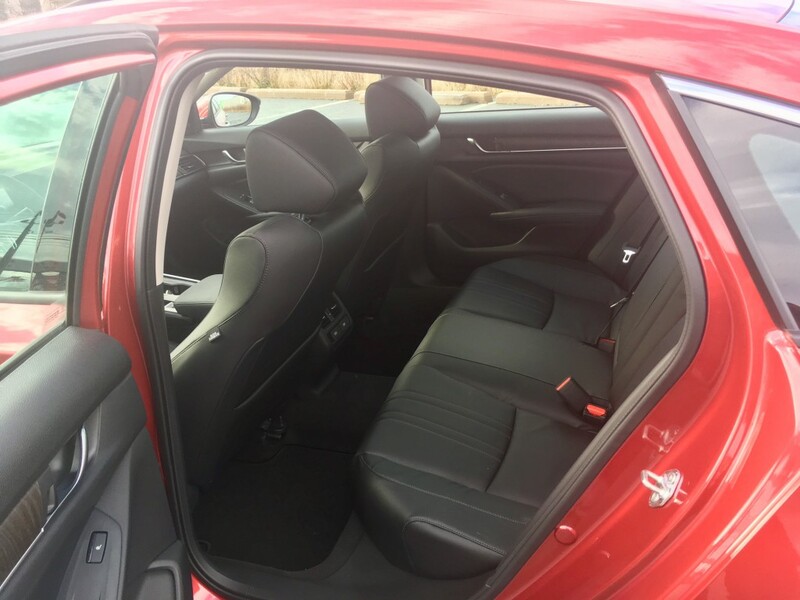 Rear seat legroom is plentiful to the point where it may even rival the Volkswagen Passat. Rear heated seats were welcomed by everyone who sat back there and there were no complaints about any lack of head, leg or foot room. The 473 litres of cargo room is more than adequate for most. It also features a tray underneath to keep fragile items from rolling about. The big news for the new Accord, aside from no more coupe, is the new engines and transmissions available. There are two engines to choose from and three transmission options. The first engine is a 1.5 litre turbocharged 4-cylinder which produces 192 horsepower and ditto amount of torque. This engine can be mated to a six-speed manual (hooray!) or a continuously variable transmission (CVT). The second engine available is a 2.0 litre turbocharged 4-cylinder which puts out 252 horsepower and 273 pound foot of torque. For this engine you can choose either a six-speed manual (hooray again!) or a 10-speed automatic. If you go with the latter, you’ll get a push button gear selector. If you go with the smaller engine and the CVT you’ll get a traditional gear shifter. 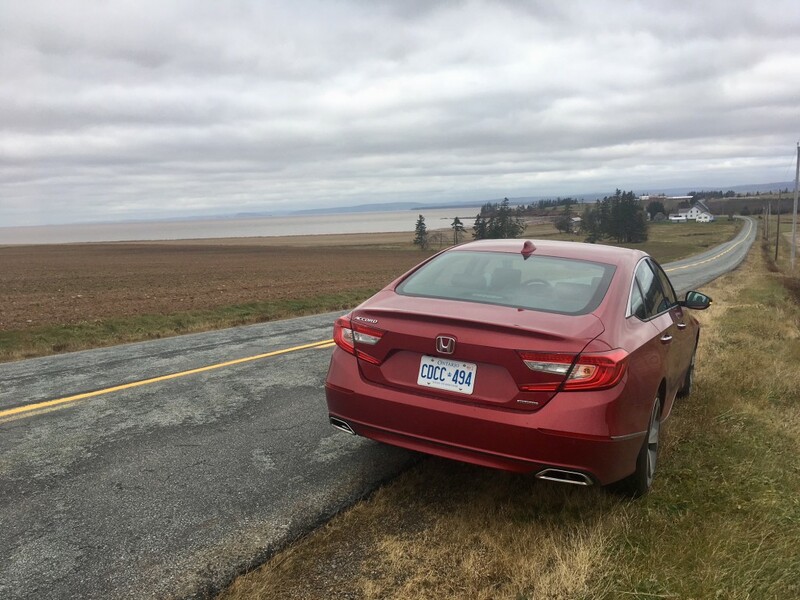 My Touring model is the highest trim and it came equipped with the 1.5 litre plus the CVT, which is pretty much the exact opposite of my personal engine and transmission preference, but I have to concede that this combo is still quite good. The 192 horses aren’t blistering in their delivery, but they can be woken up a bit more when the sport button is pushed. The CVT does what a CVT does, but it’s done in a much more refined manner than other CVTs on the market today. This is likely the engine/transmission combo that most will choose, and it will be more than adequate for most. Those looking for more fun should try the 2.0 litre with a six-speed manual (take the manuals while you still can, folks. They will be extinct in the very near future). On the road, the Accord remains as competent and compliant as it has always been. Its mass is much larger than my cousin’s ’92 Accord coupe, and it feels it, though not in any sort of negative way. 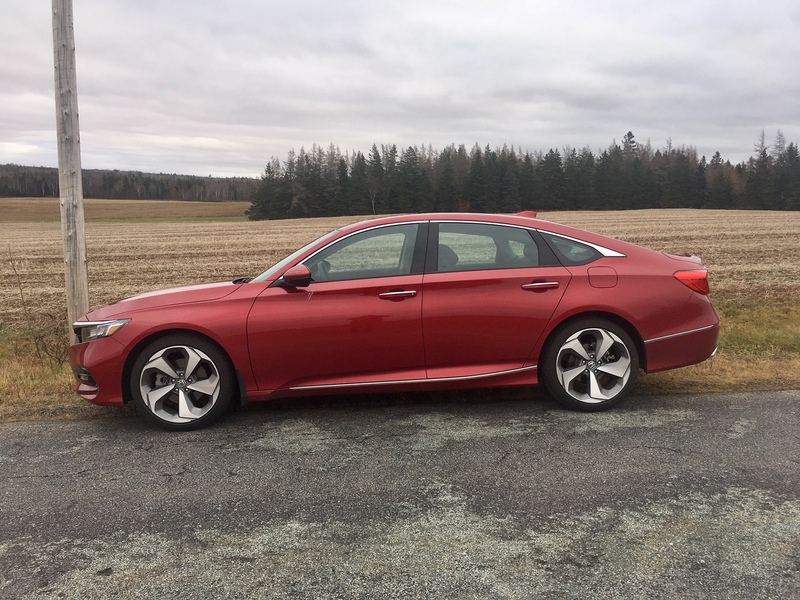 The Accord can still be tossed into a corner with a decent measure of confidence and it doesn’t seem to mind much if you do. Surprisingly, those 19-inch wheels with low profile tires don’t impede much for ride comfort. Highway driving is a relaxed experience with a hushed yet still responsive ride. The Touring model gets all the safety goodies like adaptive cruise control, blind spot monitoring and lane keep assist. As mentioned, there are different selectable driving modes: normal, sport and econ. The latter noticeably holds the Accord back, though it is likely useful around town and stop and go traffic. 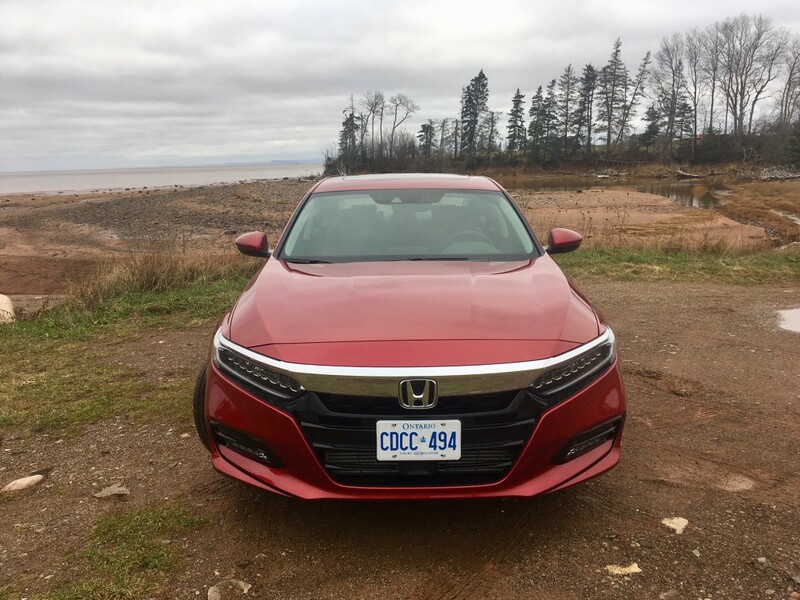 Over two-weeks of mixed city/highway driving, and mostly keeping the Accord in ‘normal’ mode, I was able to return 8.0 L/100 kms. When measured against the 1.5’s official ratings of 8.2 city, 6.8 highway, and 7.6 combined that isn’t bad, but if you actually wanted to hit or beat those numbers I would guess you would need to keep it in econ mode all the time. But 8.0 for a sedan of this size is indeed impressive. There are, however, some things that don’t impress. Unfortunately during my time with the Accord, it acted decidedly un-Accord like, and indeed un-Honda like, more than a few times. One time while driving, the entire infotainment system suddenly went blank and turned itself off. Pushing the power button didn’t bring it back to life either. I had to pull over and turn the car off then back on again to get it working. Also, I’d say about half the time, while scrolling through radio stations, the information displayed was glitchy and sometimes didn’t display the proper information. Then there was the exterior sensors which often cautioned me with dramatic flair that an accident was about to occur if I didn’t react, but there was no objects around anywhere to react to. The keyless entry system was happy to unlock the car for me, but locking it again usually took more than one try. The interior trunk release button often did not immediately respond either. The automatic high beams would come on at both odd and unnecessary times and the seat memory sometimes didn’t remember my preferred seating position. 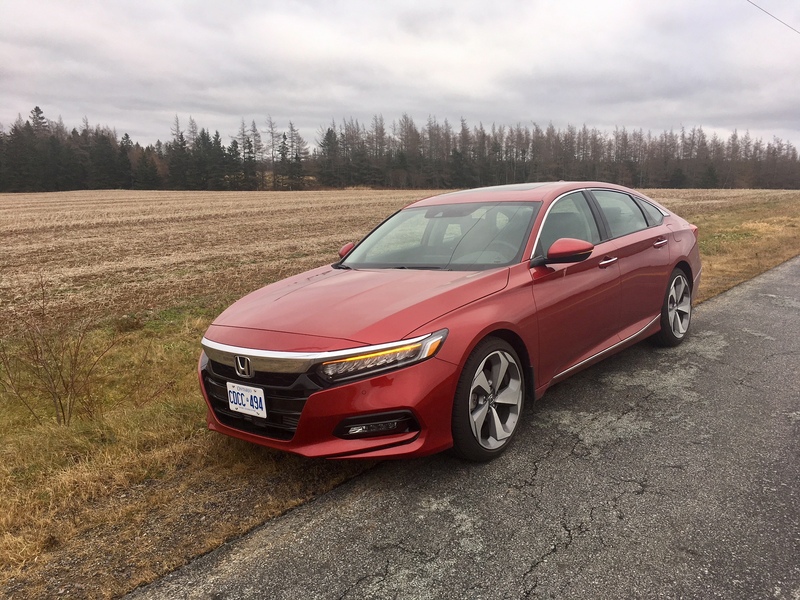 All these issues are fairly uncharacteristic of the Honda brand, but it’s possible that they were limited to just my tester. 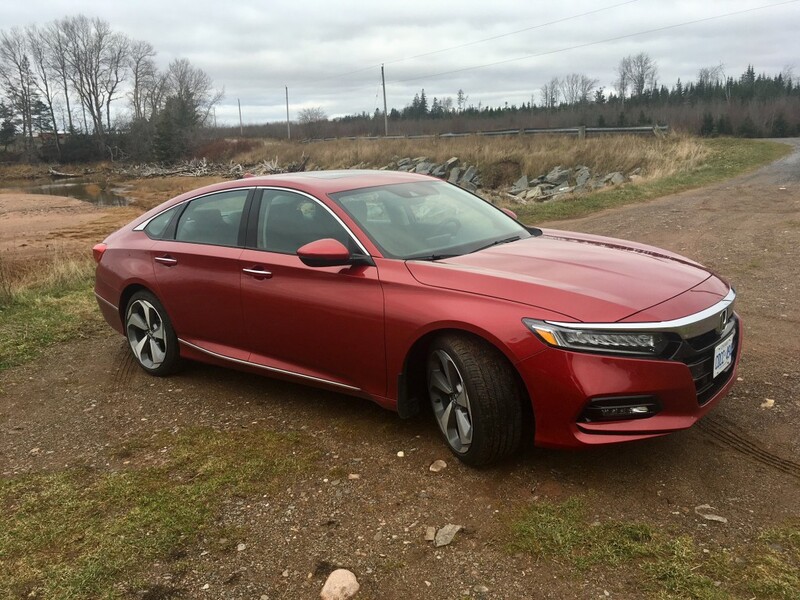 Should you be in the market and have the Accord on your list, be sure to test all those features out. Otherwise the Accord remains a favourite of mine. The family sedan segment is deteriorating quicker than American-North Korean relations, but that doesn’t mean that Accord can’t still do the job. There’s oodles of interior room, lots of premium content and tech, decent cargo capabilities and performance options that fits all needs.